MACTISICAL 3D Printer High Power Heated Bed Module MOS Tube High Current Load Power Expansion Board. This high power module is a general add-on heated bed power expansion module for 3D printer. The appearance is small and generous, and the unique design of the snowflake radiator makes the cooling function more powerful, to solve the large hot bed power and current load problem. This module is based on power MOS and will allow PID control of the heated bed (DC-DC Relays usually do not allow this). Under the premise of normal cooling, it work stable under I(Max)=30A, the current must not exceed 30A while the process working. ★ WELL MADE - The best connection is made of new materials and high quality stainless steel and the high grade aluminum blocks, which give longer product life. 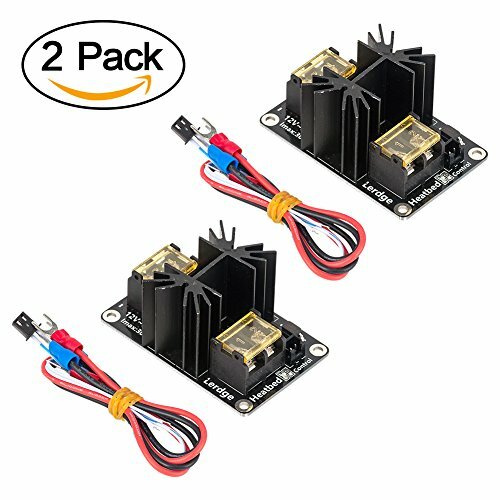 ★ CURRENT OVERLOAD - With this add on module to your 3D printer motherboard you can lead the maximum current up to 30A. ★ FEATURE - The unique design of the snowflake radiator makes the cooling function more powerful, to solve the large hot bed power and current load problem. ★ SAFETY - New terminal insulation cover to prevent leakage, to avoid electric shock, so use more safer. ★ USE RANGE - Widely used for common 3D printer models, extruder and other open 3D printer motherboards. If you have any questions about this product by MACTISICAL, contact us by completing and submitting the form below. If you are looking for a specif part number, please include it with your message.